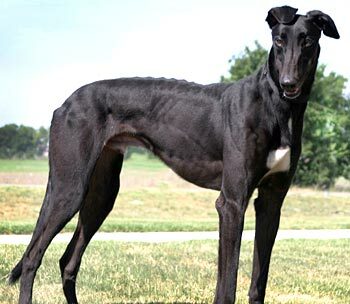 Ghee, aka Gable Ghee, is a striking, 2½-year-old black male born March 29, 2008. 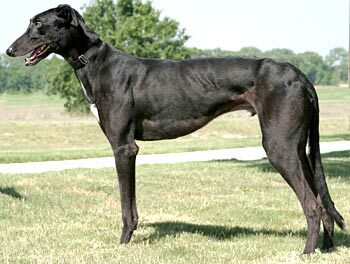 His sire is Gable Dodge, and his dam is the Irish-bred Clare Lottie. Luigi and Ghee have the same dam, but different sires. Ghee's racing career of 6 races was all at Naples-Ft. Myers track in Florida, starting January 19, 2010, and ending February 6, 2010. He definitely did not follow in his father's racing paws, but has all the traits to be a true companion pet. Ghee is not cat tolerant and has not been tested with small animals at this time. Yearning to meet a tall, dark, handsome stranger? You need to meet Ghee! His shiny coat really gleams in the sun. Ghee's an exuberant boy who's beautiful tail is in constant motion. When he's really excited, his whole body wags! He has very polite house manners. Ghee loves his walks, and would make a good jogging companion. He adores attention, is very affectionate, and is quick to follow you around the house. He crates nicely for mealtimes, and is very trustworthy when left outside the crate. He's a very smart boy who will learn anything for a treat. 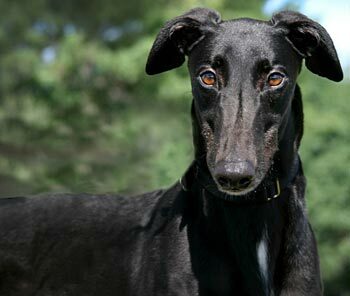 Ghee may just be the tall, dark, handsome boy you need to add to your life!